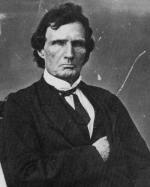 Thaddeus Stevens, by John Sartain, 1835. Born in Vermont, Stevens graduated from Dartmouth College in New Hampshire, and then moved first to York, Pennsylvania, and then to Gettysburg, where he became a lawyer and then a state legislator in 1833 as a member of the Anti-Mason Party. Decades before he became associated with the national anti-slavery movement, Stevens emerged as a powerful political force in support of universal public education. In the turbulent throes of state legislative politics during the 1830s, Stevens led the effort to defend the new common-school program against its critics. Castigating "dread ignorance" as a threat to individual liberty, Stevens championed state-supported free schools, arguing that only when one is educated, will he be prepared "to act well his part in this land of freedom." Defense of educational liberty preceded his opposition to the disfranchisement of African-Americans, adopted by the state of Pennsylvania in 1837, and his subsequent leadership in the abolition movement. Elected to Congress in 1848 on the Whig party ticket, Stevens led the legal defense in 1852 of blacks accused of killing slave hunters in Christiana, Pennsylvania. Stevens won the case, but it led to his electoral defeat later that year. Thaddeus Stevens, Industrial School, Lancaster, Pa.
Stevens was returned to Congress in 1858 as a Republican and became chairman of the House Ways and Means Committee when that party gained control of Congress during the Civil War. A leading wartime journalist described him, with considerable exaggeration, as "the despotic ruler of the House." He pushed for emancipation, the use of black troops, and black suffrage. Abraham Lincoln moved far too slowly in this respect for him. As a so-called "radical Republican" on the Joint Committee on Reconstruction following the Civil War, Stevens thought former rebel leaders should be tried for treason, executed, disfranchised for life, and their property given to the freemen ("forty acres and a mule") who for the most part had either fought for the Union, run away from, or failed to aid their masters. He fought strongly for the Thirteenth Amendment (abolishing slavery), the Fourteenth (equal rights for blacks), and the Fifteenth Amendment (black suffrage). Stevens detested President Andrew Johnson, who pardoned almost all former Confederates, gave them back their property, and refused to protect blacks trying to exercise the right to vote. 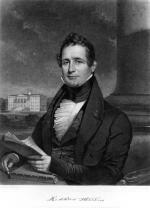 He was very active in the impeachment of Johnson and angry when the Senate failed to convict him by one vote. Always committed to the principle of racial equality, Stevens chose to be buried in the Shreiner's Cemetery in Lancaster, one of the only burial grounds in the area at that time without restrictions on race. Until the Civil Rights movement of the 1960s, Stevens was generally regarded as a vindictive, power-hungry demagogue. In D. W. Griffith's film Birth of a Nation (1915), most notoriously, Stevens was depicted with a mixed-race partner, a club foot, and an ill-fitting wig (he was bald and wore one). Today, scholars acknowledge him as a heroic and pioneering champion of civil rights. To learn more about Steven's early political career in Pennsylvania and his own scandal with the "Tapeworm" Railroad, click here. James A. Jolly, "The Historical Reputation of Thaddeus Stevens," Lancaster County Historical Society Papers 74:2 (1970): 34-63. Beverly Wilson Palmer, "Thaddeus Stevens, Equality of Man Before His Creator," Pennsylvania Heritage 18 (Spring 1992): 10-15. Hans L Trefousse, Thaddeus Stevens: Nineteenth Century Egalitarian (Chapel Hill, NC: University of North Carolina Press), 1997.